As the group of women—from working brewers to bottle-shop employees to amateur enthusiasts—makes our way through the many bottles of beer, no single attendee leads the charge on explaining each beer, nor do people jockey for the chance to speak. Conversation is curious, insightful, and most of all, open. I’m in this backyard surrounded by these women because last April, after I wrote an article about the gendered baggage that exists around “girly beers,” the club’s founder reached out to me. 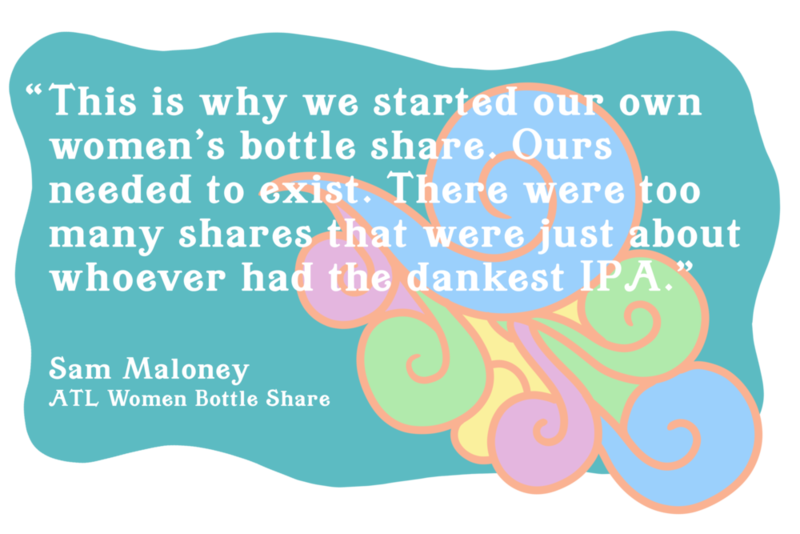 “This is why we started our own women’s bottle share,” she wrote me at the time. “Ours needed to exist. There were too many shares that were just about whoever had the dankest IPA." Curious about the prospect of a place where women could drink, say, a hot-pink raspberry Sour unencumbered by worries that she was falling prey to lame gendered stereotypes, or where someone like me could show up and taste beer without feeling compelled to mask how little technical knowledge I actually have, I decided to join them. Sam Maloney, the group’s founder, was inspired to start the share after attending a women’s beer dinner at Hapeville, Georgia’s Arches Brewing, during which she was struck by how welcome and comfortable she felt. The laid-back, open vibe contrasted with her experiences at other mixed-gender, male-dominated beer events she’d attended in Atlanta, where men spoke over her and each other constantly, and where the primary focus on each beer seemed to rest not in its taste, but in its IBU rating or its scarcity. Maloney remembers one attendee sheepishly asking the group to explain the difference between a Porter and a Stout, and subsequently “getting roasted” by his cohorts. One of the women present at the share’s inaugural meeting back in 2017 was Ai-Lien Vuong, an avid craft beer drinker for nearly a decade. Like Maloney, Vuong had also sporadically attended a few male-dominated shares, and found them to be generally positive experiences, but couldn’t help noticing when men would talk over her to explain a beer, or assume she would be turned off by overly hoppy IPAs (when, in fact, the opposite is true). There was an intangible sense of “feeling the need to prove as a woman that you know just as much, sometimes more, about beer than your male counterparts,” Vuong says. This wasn’t a wholly unfamiliar experience: Vuong is also a fantasy football player, and had played in a male-dominated league for years until joining an all-women’s league in 2014. While the technical aspects of both leagues were the same, Vuong sensed that women in the mixed-gender league were perceived as less of a threat, and generally assumed to know less about the game. Similarly to her experience in beer circles, Vuong says, “You definitely feel like you have to constantly defend your skills and decisions more in a mixed-gender league than in an all-women's league, at least from my experience.” She sees both the women’s beer share and the league as inclusive, welcoming spaces where newcomers can actually learn, rather than quietly fumble their way through for fear of being judged. And for those who aren’t newcomers, spaces like these serve an equally important purpose: a chance to exhale. One of the group’s early adopters was Zuri Coleman, the only woman working on the production floor at Atlanta’s Second Self Beer Company. Coleman has four years of experience making beer, but even with that foundation of knowledge, she still appreciates the opportunity to let her guard down among women. Coleman is also a member of the Atlanta chapter of the Pink Boots Society, an organization for women working in beer. I ask her: why are such spaces important to women in the industry? “To remind ourselves not to give up if you're feeling discouraged by working around a bunch of dudes all day,” she answers without skipping a beat. Brittany Graham, a beer sommelier and BJCP judge who works in beer retail, says that in much of her professional life, she’s forced to constantly demonstrate her own beer knowledge, and assert that she belongs. When faced with these struggles in the workplace, she says, one’s confidence can take a hit. At her first beer share, Graham recalls, she showed up with her notebook, ready to analyze and take notes with the same academic rigor that’s governed her trajectory in beer thus far. “I have been working so hard proving myself, and getting used to having to prove myself around men,” she explains. Women’s spaces within male-dominated cultures are not new. Whether it’s tech, or academia, or fantasy football, or cigars, or beer, women have found ways to find each other, and to stake out their own enclaves. Laurel Ruma is a member of BABES (Boston Area Beer Enthusiasts Society), a 2,500-member women’s beer group. Ruma also works in tech, an industry infamously noxious with sexism. She recalls a Ruby on Rails conference a decade ago with a male speaker who had accessorized his presentation slides with a bare-breasted woman. Few people in the audience raised an eyebrow. Whether it’s hosting a side-by-side tasting of Heady Topper and Pliny the Elder with 20 women in her backyard, or venting to her women-in-tech Slack chat about a keynote speaker who took the stage wearing a T-shirt emblazoned with a naked lady, Ruma understands that the importance of a safe space largely comes down to the freedom of exchanging ideas within a group that shares a similar vantage point, without the threat of being stampeded by those who typically dominate that space. In other words, when one is constantly spoken over, spaces like these can offer a chance to speak. The beer share that Ruma attends was founded by Kristen Sykes in 2011. Sykes, a BJCP beer judge who started brewing beer in the early 2000s, has hosted a number of mixed-gender events over the years, too. She has observed that in those events, women who are typically outspoken about beer tend to cede the floor to the men in the room, some of whom may talk more while knowing less—a real-life Dunning–Kruger roleplay. The resulting atmosphere is one in which women are less inclined to speak up, says Sykes. Admittedly, as I was preparing to attend the share for the first time, I too was a little intimidated. I’m more of a casual beer enthusiast than a connoisseur, and I wasn’t even sure what to bring. In fact, that night’s theme—single-hop or single-malt beers—had me stumped to the point of desperation (e.g., Texting a Man for Help while standing in the grocery store). It was a woman who stepped in, though. On the recommendation of a woman working behind the counter at my neighborhood growler shop, I ended up bringing a hazy single-hop IPA from TrimTab Brewing Co. While she bagged the beer, I thanked her, and sheepishly confessed my nerves about attending the share for the first time. “It’s just beer!” she said. We both laughed and rolled our eyes, because most women who drink beer in public know there’s little “just” about it. My maiden voyage to the bottle share had me nervous because I didn’t know what those norms would be: would the group judge me on the quality of the beer, the prestige of the brewer, the coolness of the label? Was I getting the theme right? Would it taste good, and if not, how would that reflect back on me, personally? Are these the kind of beer drinkers who roll their eyes at fruit beers or dessert-style Stouts? My worries, though, were immediately assuaged after experiencing the group first-hand. My second time around, I tossed a six-pack of Three Taverns Brewery’s Midnight Snack (an Imperial Coffee Milk Stout) in my car with nary a care in the world, despite it not jiving with the theme. Had I been entering into a room full of men, I doubt my experience would’ve been quite so carefree. In social settings like these, consumption and performance intersect in curious ways: a woman beer drinker may not feel like she is allowed to be a true aficionado if her contribution to a group of other beer nerds is a fruited Wheat Beer—especially if that group, when dominated by men, sees beer as an avenue through which to perform their masculinity. More important than the beer itself are the spaces we make for ourselves, and for our cohorts, as beer drinkers. The energy and atmosphere of these shares are never random, and are dictated in subtle—and sometimes not-so-subtle—ways by the people participating in them. A space in which members compete for speaking time or focus more on the rarity of a bottle than the liquid inside of it will feel different, by every measure, from one in which questions are welcome and curiosity is encouraged. After all, beer is something to be learned about and enjoyed—not something to brandish in assertion of one’s gender. But a little Britney every now and then can’t hurt, either.